The William C. Rives Collection: Remarkable Connections in Southeast Asian Paintings | Skinner Inc. In March of 1999, William C. Rives purchased what he thought was a beautiful and outstanding painting at an auction in Singapore. The painting was by Alix Aymé, and was of a tranquil river landscape in Luang Prabang, Laos (Lot 42 in the September 19th Asian Works of Art auction). 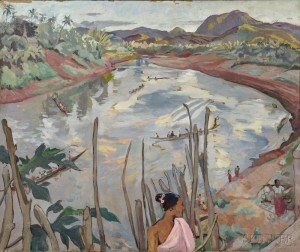 Rendered with sensitive brush strokes and an exquisite color palette, the painting depicts a woman dressed in pink, standing on a bridge overlooking the Nam Khan river, where boats skim across the surface of the water which in turn reflects the mountains and sky above. Alix Aymé was an extraordinary woman and artist in her time. Born in Marseilles, France in 1894, to a wealthy and cultured family, Aymé was able to travel extensively. After marrying her first husband, Aymé traveled to Hanoi with him and embraced her life there to such an extent that she chose not stay in France with her husband when he returned. A mission from the French Government to prepare for the Colonial Exposition in Paris sent Aymé to Luang Prabang, Laos, where she was ultimately introduced to the Royal family. In 1931, King Sisavang Vong commissioned her to paint a grand mural for the reception room of the palace. The resulting mural consists of five scenes typical of Luang Prabang, a market scene, Wat Mai, Wat Xieng Thong temple, and rural and river scenes. Photography is forbidden at the palace and the paintings, which are considered national treasures, have not been reproduced in any publications. Preparatory sketches for the mural are known to exist, and have been published in Alix Aymé by Pascal Lacombe and Guy Ferrer. In some respects, Rives’ story parallels that of Aymé. Born in Charlottesville, Virginia, Mr. Rives spent twenty-two years living in Southeast Asia, where he taught history, art history, psychology and English and was Chairman of the History and Social Sciences Department at the Singapore American School. While living in Singapore, he regularly attended art auctions and would purchase select pieces from the sales, adding to both his personal collection and his appreciation of Southeast Asian art. From Singapore, Mr. Rives was able to travel throughout Southeast Asia to some remote and exotic locations. One of his travels brought him to Luang Prabang, where he was astounded to discover that the very scene depicted in his painting was part of the mural featured on the walls of the Royal Palace. 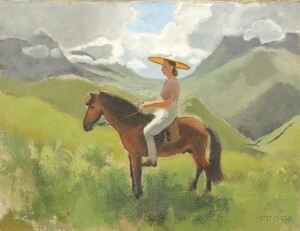 Another painting that Rives purchased during this time was a portrait of a woman on horseback in Sa Pa, Vietnam, by Joseph Inguimberty (Lot 43). Recent research on the work of Inguimberty has left scholars believing that this portrait in fact depicts Alix Aymé, who was a friend and contemporary of Joseph Inguimberty. A photograph of her polishing lacquer taken in 1950 shows her with the same pulled-back hairstyle. The work of Aymé and Inguimberty is coming into prominence with a recent exhibition of Aymé’s work at Johns Hopkins University Museum, and the publication of a catalog of Inguimberty’s works. On September 19th Skinner is proud to offer over twenty lots of fine painting and sculpture from the collection of William C. Rives, including superb examples of work by Rudolf Bonnet, André Maire, Hans Snel, Frits Ohl, and Co Chu Pin, all depicting colorful and lively aspects of life in Vietnam, Laos and Malaysia (Lots 42-60). This entry was posted in Blog and tagged Alix Aymé, Andre Maire, art auction, asian works of art, boston, boston auction, Co Chu Pin, Fine Paintings, fine sculpture, Frits Ohl, Hans Snel, Joseph Inguimberty, Laos, oil painting, painting, Rudolf Bonnet, Singapore, Singapore American School, skinner, skinner auctions, Southeast Asia, William C. Rives by Helen Eagles. Bookmark the permalink.